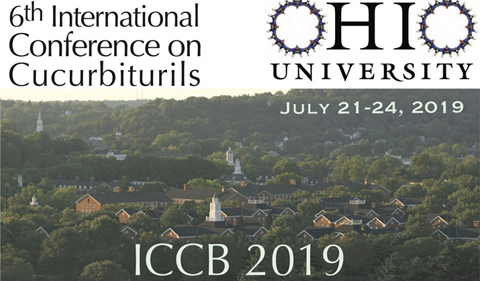 Dr. Eric Masson, Associate Professor of Chemistry and Biochemistry at Ohio University, and Dr. Adam Urbach, Professor of Chemistry at Trinity University in San Antonio, Texas, are hosting the 6th International Conference on Cucurbiturils on the Ohio University campus this summer. Cucurbiturils are macrocyclic molecules that resemble hollow pumpkins; they accept other compounds (called guests) inside their cavities to form supramolecular host-guest complexes. 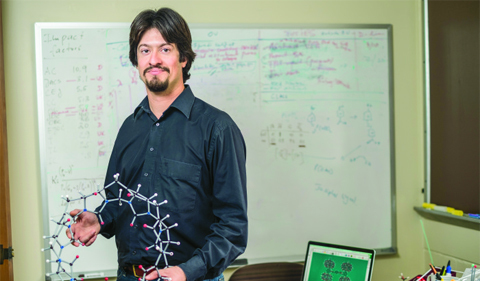 Applications of these systems range from catalysis to the stimulus-sensitive capture and release of drugs. The conference will start on Sunday, July 21, and end on Wednesday, July 24. Lectures will take place in Walter Hall. Pioneers of supramolecular and Cucurbituril chemistry from 18 different countries will give invited lectures. ICCB started as an international workshop in College Park, Md., in 2007, followed by five conferences in Pohang, South Korea (2009), Cambridge, United Kingdom (2011), Canberra, Australia (2013), Tianjin, China (2015), and Brno, Czech Republic (2017). Ohio University is proud to host the sixth conference of the series. The event is sponsored by the College of Arts & Sciences, the Vice President for Research, Trinity University and Strem Chemicals, and by high-impact chemistry journals Chemical Communications, the Journal of the American Chemical Society and the Taylor and Francis publishing group. Registration is online and is open until June 1, 2019. For more information, please do not hesitate to contact Masson at masson@ohio.edu.